When things were desperate for Kaine, James Balcombe stepped in last minute to fill in for drummer Chris MacKinnon at the bands final Renegades Tour date at the Camden Barfly. His main band Osmium Guillotine, which he founded in 2009 are about to release their first album. Osmium Guillotine and Kaine have been working together now for a number of years, jointly releasing “Killotine” in 2012. More recently Kaine lead guitarist, Anthony Murch has been filling in on Lead Guitar for the Osmium Guillotine for a number of shows over the past 6 months. James is also the drummer in the Punk-Rock band The Tickturds which can be found touring nationwide. Kaine bassist Dan Mailer has featured for that band, having stepped in to play in place of Luke Fisher for two shows earlier this year. Rage sat down and interviewed James recently about the new album and the band which can be read below. Rage: First things first as the only surviving original member of the band, did you ever once consider calling the album “Osmium Guillotine: Featuring James Balcombe “? Rage: So as one of the originators of the British Metal Revival movement, how did the band start and why? James: The band started in 2009 when myself and (original bass player) Elijah Kindon met in a pub and decided it would be cool to form a band, both being into the same type of music, I bought myself a drum kit and we started jamming in the garage of the pub I lived in, not long after we were joined by Barbora on guitar, and Tom Chittock on lead vocals. We started off playing a mix of punk and metal covers, before a couple of line-up changes meant we started focusing on our own material. Rage: At last there’s finally an Osmium Guillotine full length album, when will we be able to buy this and where from? James: The album is released on 6th June 2014, it will be available on CD and Digital formats from our bandcamp at www.osmiumguillotine.com as well as being on Amazon, iTunes, Spotify, and will be available to buy at any of our gigs. Rage: So the album was recorded by Anihilated (legendary British Thrash band) guitarist Danny B, what was it like working with Danny and how do you think the album turned out sound wise? James: Both in terms of production, and musically, this is the best we’ve ever sounded. Our previous releases sounded great of course, but Danny is an expert at getting just the right mix for that traditional heavy metal sound. Working with Danny was great, really nice and easy going bloke, but at the same time if he thought a take was crap, he won’t hesitate to make you do it again to guarantee the best result! Rage: You have quite a range of tracks from Thrash, to NWOBHM and even a Groove track, what do you attribute this to? What’s influenced the album? James: The band have a variety of influences between us, but primarily the early names of British heavy metal such as the likes of Black Sabbath, Iron Maiden, Saxon, Motorhead, along with the thrash bands such as Metallica, Megadeth were our main influences. But as you say there’s various other influences creeping in there such as groove metal, doom metal, even a touch of pirate/folk metal on a couple of tracks. As metal as a genre has evolved over the years to so many varying styles, we don’t really like to limit ourselves to one specific style. Rage: How did you find recording the drums for this record? James: Recording the drums was an interesting experience, as it was the first time we’d recorded the instruments separately (with all the drum tracks being laid down before the bass, guitars and vocals being added), on our previous EPs we’d recorded each track live, with everyone playing together as a band. So that added a bit of extra challenge, but it’s obviously a more beneficial way to record, from a producer’s point of view. Rage: Pete (Keliris) is now the bands sole singer, how did that work out when recording the album? James: Obviously since the departure of co-founder and co-vocalist Elijah, Pete was forced to take on full vocal duties, which has naturally given the band a new sound as he has a very different vocal style, Pete never actually intended to be the vocalist when he originally joined as second lead guitarist, but I personally think he’s done a great job of stepping up the task and some of his vocal work on the album sounds like he’s been doing it for years. Rage: Lance (Steele) has also been with the band for some time now, the longest serving member other then yourself, how has working with Lance been? James: Lance “the legendary man of” Steel, to give him his full title, what a jolly nice chap and fantastic guitarist he is. He was quite the perfectionist when recording his guitar parts for the album, he’d nail a guitar solo first time, and the rest of us would be like “That sounded awesome!” and Lance would go “Eh, I can do it better”, and then, yep, he’d do it even better. Rage: Dan (Thurgood) is the “new guy” and he’s come along way since he joined the band last year, how is it like working with Dan and what has he brought to the table in terms of the album and his bass playing? James: Dan has fitted into the band really well, he has quite a different style of bass playing to Elijah which naturally brings a different dimension to the band’s sound. This is most notable in the song Goomba which was one of the first new tracks we wrote with this line-up, that song starts with a bass intro and has more of a groove sound to it. He also shines on the instrumental track ‘Breathe it in, son’ which has a cool bass line and solo. Rage: You have some songs written with Elijah (Kindon) on this record, I understand he will be joining you on stage for the five year show later this year? Is there anything else we should know about the show? I trust there’s no current legal battle over the bands name/musical direction under your leadership? James: Yeah the lyrics for 3 of the album tracks are credited to Elijah, and are re-recordings of tracks featured on our last EP (Subhuman). June 28th will be our special “5th Anniversary Gig”, where, as an encore, I’ll be joined onstage by the 3 other members of the ‘original’ line-up for a special one-off set of songs we’ve not collectively played together since 2010. As for legality? Naaah, there was never any animosity between the members, Tom and Barbora left in 2010 and Elijah decided he wanted to go down a different musical avenue and left at the end of 2012. All the former members get a thanks in the album sleeve for their involvement in the band, and all credit is given where credit’s due. Rage: Your annual, award winning festival “OGFest” was a huge success this year and the biggest one yet. How much money was raised for your charity (Parkinsons UK) and how was running the event like at the Asylum in Chelmsford? James: This year’s OGfest was held at Asylum in Chelmsford (the previous 4 years had been at St Anne’s Castle in Great Leighs), at the time of writing we’d raised well over £500, which isn’t bad going for a little alternative venue in Chelmsford! The event was free entry so we relied purely on donations; I also had official OGfest 2014 T-shirts for sale with all the proceeds going to the charity as well. The original plan was a two-dayer with two stages, but after the venue had a change around and converted the downstairs stage into a social area with a pool table, it meant I was forced to extend the festival to an epic 4-day Friday-Monday marathon, it was a long weekend but it was bloody good fun! Every band was amazing, all the people were great, and there was a solid turn-out every day to support each band, so that all made it awesome. Rage: You have a new track that debuted on your radio show a short while ago, when can we expect to see this recorded and released officially? Are there plans for any other releases? Will you be putting them out yourselves or working with MGR? James: The new track “A Million To One”, (based on the story of HG Wells ‘The War of the Worlds’) is our longest song to date, at just over 10 minutes long, we debuted it on the radio and have since played it live a couple of times, it’s been very well received. We have no immediate plans yet to record it but I’m sure it’ll end up on the next studio release, whenever that may be….. Although we do have the recordings from the radio show, so it’s quite likely we’ll release them, possibly as bonus tracks. Our 5th Anniversary gig on 28th June is going to be recorded live, so assuming all goes well with that, you can expect a live album at some point in the not-too-distant future, when it will be out and who will be releasing it, I can’t yet answer! Rage: Anything else you would like to add about the new record? James: It’s been great fun to make, and I’m very proud of it, certainly the best thing the band have ever produced. For me this is essentially the result of 5 years love and labour as part of the band, so if other people enjoy it and buy a copy, then that just makes the whole thing even more worth it! 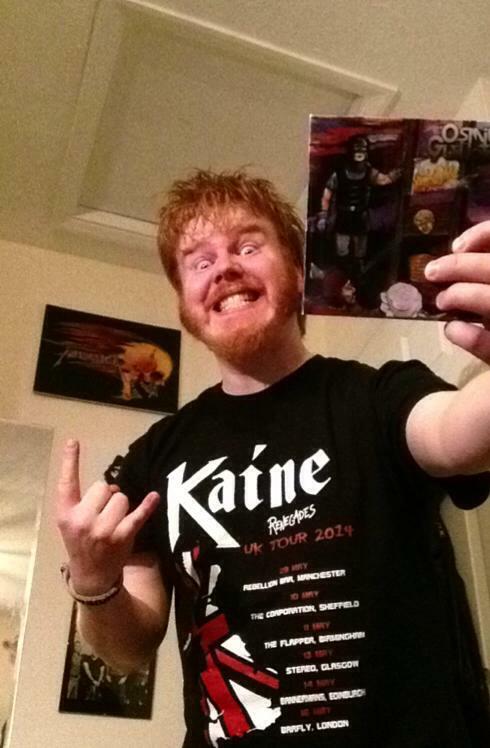 Kaine – Pre-Order “The Waystone” Tonight!